What To Look For When You Want To Buy A Good Log Wood Splitter - A Detailed Review! The log splitter... a cure for the tiring endless hours spent with your axe and covering your hands with blisters. Finally you decide to buy an electric or gas powered log splitter. 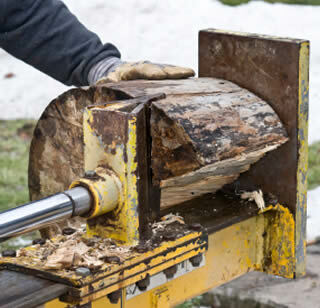 Apart of helping you avoid the back pain, a splitter is a machine that makes short order of firewood - quickly. The time saving can be significant, 5 fold claimed by some manufacturers. Time saving alone makes buying a log splitter a smart choice. Before you shelling out the cash for any log splitters, lets tackle the task and review the details of your axe replacement. When you compare the wide assortment of different log splitters on the market, you will soon discover that price alone should not be the first criteria. You want a comparison of splitters that meets your needs and demands in the logging market. Technically Electric log splitters are the simplest kind of splitter available. An electric motor powers the hydraulic pump and is usually the first choice if limited amount of firewood is needed for the home. The electric powered motor makes for easy handling, requires little to zero maintenance and sets up very quickly to get the job done. - Dependence of electric power, making electric log splitters restrictive in working in the yard or in the woods or forest. - Electric log splitters usually deliver limited power of up to 2.5 HP using 120 V (North America) or 220 Volts (Europe). Gas power is absolutely the first choice for professional and commercial use when reviewing log splitters. Technically a gas powered log splitter works like an electric one, with the gas powered motor driving a hydraulic pump which pushes a hydraulic cylinder into the wood. Since the motor is gas powered, the log splitter operates independently from any power supply. Depending on the model and task, gas operated splitters can generate much more force and power (up to 40 HP) when compared to electric driven models. The last type of log splitters are the tractor or skid steer driven splitters. You will find their use on primarily on farms and in commercial forest operations. The log splitter connects to the tractor's hydraulic system, powering a cylinder that presses a wedge into the wood. Tractor log splitters models are usually extremely durable and robust. Like the gas powered splitter no direct motor is needed as a power source. However the maintenance cost needs careful consideration since a tractor is required to power sometimes even a small log splitter.